The Chi Phi Fraternity, as it exists today, is the outgrowth of three older organizations, each of which bore the name of Chi Phi. These organizations were the Chi Phi Society, founded at the College of New Jersey (Princeton); the Chi Phi Fraternity, established at the University of North Carolina; and the Secret Order of Chi Phi, founded at Hobart College. The first of these older organizations, the Chi Phi Society, which is known in the history of the Fraternity as the Princeton Order of Chi Phi, was established at the College of New Jersey, later Princeton University, on December 24, 1824, by Robert Baird, then a tutor in the college and later a prominent Presbyterian clergyman. Also involved in the formation of this secret Chi Phi Society were a number of faculty members of both college and seminary as well as undergraduates of both institutions. This society ceased to be active in 1825. Thirty years later, in the winter of 1853-54, John MacLean, Jr., found among the papers of his uncle, John MacLean, president of Princeton University, the old constitution, minute book, and ritual of the Chi Phi Society of 1824; and with these as his guide, he united with Charles Smith Degraw and Gustavus W. Mayer in reorganizing the old society at Princeton along "modern lines." The old motto and a great part of the ritual were retained. In the fall of 1854, Mayer organized a second chapter of the Chi Phi Society at Franklin and Marshall College. Joseph Henry Dubbs, later a distinguished professor of history at his alma mater, was the first initiate. The opposition of the Princeton faculty and the prohibitory pledge required of freshmen by the institution caused the death of the reorganized Princeton chapter in 1859. Its records were destroyed by the last active members, leaving the Lancaster chapter alone to represent the society. The second of these older organizations, called the Chi Phi Fraternity and now known in our history as the Southern Order of Chi Phi, was founded at the University of North Carolina on August 21, 1858, by Thomas Capehart, Augustus Flythe, John C. Tucker, William H. Green, Fletcher T. Seymour, and James J. Cherry. All students at the university, they organized this club to perpetuate their friendship and named it Chi Phi Fraternity. They wished to expand, so chapters were rapidly organized at Centenary, Davidson, Virginia, Nashville, and Cumberland. However, the American Civil War (1861-65) meant the end of all but the parent chapter. Soon after the war, new chapters sprang up at Hampden-Sydney, Georgia, Edinburgh (Scotland), Mercer, Emory, Oglethorpe, Trinity, Kentucky Military Institute, and St. John's. The extinct chapters at Virginia and Davidson were reorganized. Following the war, however, the University of North Carolina itself was closed, necessitating the transfer of the "Alpha" chapter title to the Virginia chapter. While this Chi Phi organization had a constitution and held conventions, the primary authority rested with the "Alpha" chapter. When the chapter at North Carolina was reestablished, it took on the hyphenated name "Alpha-Alpha." Those chapters of Chi Phi with hyphenated names indicate that upon the reorganization of the chapter, its name had already been taken. The chapters' original designation is then preceded by a hyphenated Alpha. The Secret Order of Chi Phi, which is now known in the history of the Fraternity as the Hobart Order of Chi Phi, was formed at Hobart College on November 14,1860, by Amos Brunson and Alexander J. Beach, who were both students at the college. Because they were dissatisfied with the fraternities existing at Hobart, they associated themselves with John W. Jones, George G. Hopkins, Edward S. Lawson, Samuel W. Tuttle, David S. Hall, David P. Jackson, William H. Shepard, Harvey N. Loomis, William Sutphen and Frank B. Wilson to found the Upsilon Chapter of the Secret Order of Chi Phi. From Hobart, charters were soon issued to new chapters at Kenyon, Princeton, and Rutgers. Five years later, the Secret Order of Chi Phi at Hobart learned of the existence of the Chi Phi Society at Franklin and Marshall College in Pennsylvania and on May 29,1867, the two societies formally united. 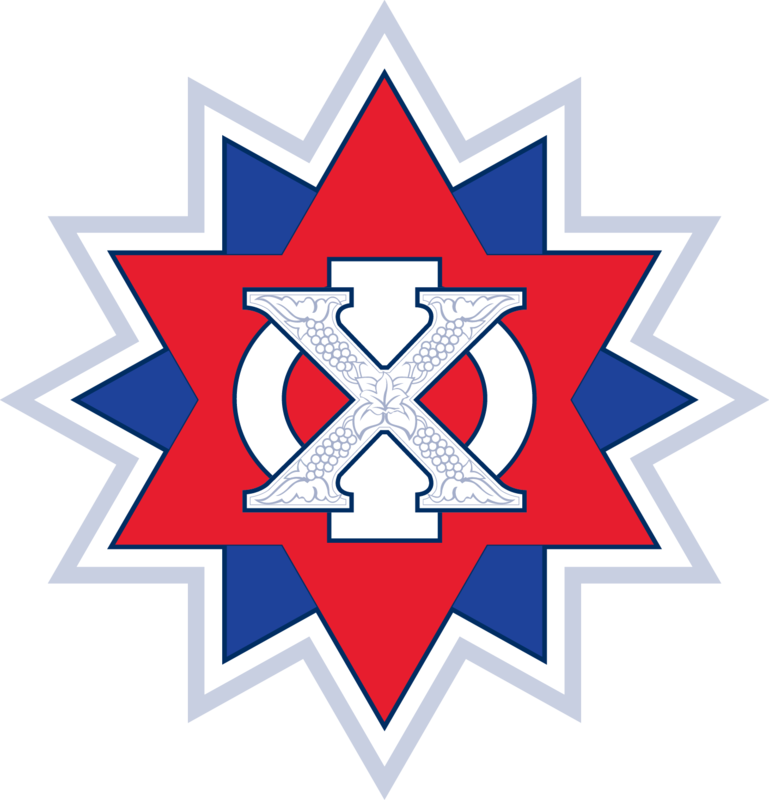 The Northern Order of the Chi Phi Fraternity was thus formed, and later placed chapters at Muhlenberg, Cornell, Dickinson, Wofford, Washington and Lee, Lehigh, Brown, Massachusetts Institute of Technology, Amherst, Ohio Wesleyan, and Lafayette. In early winter of 1865-66, the Hobart alumni in New York learned of the existence of the Chi Phi Fraternity in the South through John R. D. Shepard, a member of the Alpha Chapter at North Carolina. Negotiations for union were initiated but languished until the northern Chi Phis placed chapters at Wofford and Washington and Lee in 1871-72. Particularly through the energy of the members of the latter chapter, negotiations were renewed, and the union was finally accomplished during a meeting in Washington, D.C. on March 27, 1874. The new organization took the name Chi Phi Fraternity from the Southern Order, while the fabric of organization and ritual were taken from the North. Chi Phi, like other fraternities, had lost heavily in both chapters and membership during the Civil War. This was especially true of the Southern Order where entire chapters had volunteered for service and where the effects of the war had largely destroyed southern institutions of higher learning. The period following the war, Reconstruction, was largely defined by regional differences even though the union of the Northern and Southern Orders of Chi Phi occurred in 1874-a unification that illustrated the strength of the common ideals that drew the two orders into union. Chi Phi Fraternity was among the first to forget sectionalism and to extend the hand of brotherhood after the war. This step was largely attributable to the leadership Georgian Henry W. Grady, and northern Chi Phis of similar mind. A unique result of these times was the establishment of the Theta Chapter of Chi Phi at Edinburgh University, Edinburgh, Scotland, in 1867. After the war, as many southern colleges and universities were largely destroyed, many prominent students went abroad to complete their studies. A group of men, two of whom were already Chi Phis, were granted a charter by the Chi Phi Fraternity in 1867. The chapter was active for a few years but added no new members. Eventually, as many southern colleges reopened, the charter for the Theta Chapter was withdrawn in 1870. This is thought to be the only chapter of an American college fraternity ever to have been established in Europe. Another geographic milestone for Chi Phi Fraternity happened when Lambda Chapter was established at the University of California on February 11, 1875. Lambda Chapter came about when two Chi Phis from different chapters, attending the University of California, happened upon each other on the cable cars in California. The sequel is well known: With determined zeal, they found suitable men to form a new chapter. Formal application was sent to the Grand Officers. A vote of the chapters was taken and the charter was granted to Lambda. Chi Phi was the second fraternity on the campus of the University of California. Chi Phi had truly become a national fraternity with coast-to-coast presence. Further westward expansion followed in 1892 with Nu Chapter at Texas. Other west coast chapters did not arrive on the scene until the 1930s when Delta Delta at UCLA, Epsilon Delta at Oregon State, and Eta Delta at Southern California were established in quick fashion. The official publication of the fraternity is The Chi Phi Chakett, a semi-annual magazine distributed to all alumni. The Chakett was fi 1868 by Zeta Chapter at Franklin and Marshall College. It was the first fraternity chapter paper published in the United States. It appeared again in 1869 and 1872, edited by the Pennsylvania chapters. It appeared in 1874 as The Chi Phi Quarterly, which was issued regularly until 1891. It was then superseded by an official journal, again called The Chi Phi Chakett. Until 1924, The Chakett was purely an official bulletin, its place being filled as far as general interest was concerned by annual yearbooks. Since 1924, it has appeared regularly as an open magazine. An Alumni Directory, giving names, addresses, and telephone numbers is published periodically. In 1924, a Chi Phi Memorial Volume, edited by Dr. Theodore B. Appel, was issued, dedicated to Chi Phis who had lost their lives in the service of their country. In addition to a complete history of the fraternity, it contained full biographical details of the members. In September of 1924, Chi Phi celebrated at its annual Congress in Chicago, the centennial of the founding of the Chi Phi Society at Princeton, the seventieth anniversary of the founding of its oldest active chapter at Franklin and Marshall College, and the semi-centennial of the union of the Northern and Southern Orders. At these exercises, the sixteen general fraternities organized before 1854 were represented by official delegates, as was the National Interfraternity Conference. In 1939, the fraternity published The Chronicles of Chi Phi, a monumental history of the fraternity prepared by Dr. Theodore B. Appel, Zeta 1889 (Franklin and Marshall). In addition to a complete history of Chi Phi, the work throws much light on the early origin of fraternities and their development in the American college system and has accordingly been of wide interest in the fraternity world. It contains the history of the fraternity, histories of each chapter, information on the various administrations of the fraternity, and numerous pictures of fraternal history. The fraternity annually awards the Sparks Memorial Medal to the member of each chapter achieving the highest grade point average for the year. The Congress of 1924 authorized the awarding of this medal as a tribute to the memory and work of Dr. Edwin E. Sparks, Alpha-Chi 1884, Iota 1884.He was a founding member of the Ohio State and Ohio Wesleyan chapters and was President of Pennsylvania State University when the Alpha Delta Chapter received its charter. He served on the Grand Council, was Editor of The Chakett, and made chapter visitations on behalf of the Grand Council. The Chi Phi Educational Trust was organized September 8, 1930, for the purpose of assisting deserving students and promoting scholarship and leadership. It has become a vital part of the success of Chi Phi. For many years, Brother Alfred Hutchinson, Xi '09 (Cornell), generously supported his fraternity and the Educational Trust through volunteering and financial gifts. At the 1930 Congress, then Grand Alpha Hutchinson made a proposal that has had a dramatic impact on the fraternity ever since. He fostered the formation of The Chi Phi Educational Trust to reward scholarship and academic endeavors, enhance leadership skills, promote personal development, and foster interpersonal relations within the fraternity. It was also in 1930 that the fraternity recognized the need for an executive secretary to handle the affairs of the fraternity. Until that time, the affairs were handled by the various members of the Grand Council at their homes or places of work throughout the country. Philip Schiesswohl, Sigma '15 (Illinois), was the first executive secretary, followed by Hugh Dorsey, Jr., Gamma '33 (Emory). The first space for a national office was rented in 1943 in Atlanta when Judge Luther Z. Rosser, Omega '08 (Georgia Tech), took over the position. The "Judge," as he was affectionately known, led Chi Phi through the barren years of World War II. During the war, chapter membership was minimal, and most chapter houses were used by the armed forces. In 1946, with the new title of National Director, the Judge undertook the task of rejuvenating the closed chapters. He traveled extensively re-educating returning members on the ritual and organization of the fraternity. In 1960, the Constitution was changed to add the Grand Epsilon and Grand Zeta as voting members of the Grand Council. Later, the Grand Beta was granted voting rights, and in 1970 the undergraduate positions of Grand Theta and Grand Iota were added to the Grand Council. There are normally nine voting members of the Grand Council. If there is a Grand Alpha-Elect, he casts the tenth vote. From the 1940s until 1965, the national office staff consisted of the National Director and two secretaries. In 1965, the position of Assistant National Director was created. In 1980, a second assistant was hired. In 1985, the position of Director of Chapter Services was created. Also of interest is the service of Adelaide Tyson, hired in 1946 as a secretary, who served the fraternity for 47 years until she retired in 1993. In 1968, the Chi Phi Educational Trust began to offer educational programs oriented toward the assembly of undergraduate delegates. For years, this program was tightly intertwined with the occurrence of Congress, with educational sessions intermixed with the legislative sessions of the meeting. Effective with the Congress of 1970, the educational program was identified as the Krannert Leadership School, named in recognition of Dr. Herman C. Krannert, Sigma '12 (Illinois), who donated funds to assist with support of the annual program. Brother Krannert entered the Chapter Eternal in 1972. From 1960 to 1975, Brother Carl J. Gladfelter, Alpha-Tau '33 (Michigan), served as National Director. It was during his service that fraternity expansion became important and necessary. While 1935 to 1960 saw other fraternities engaging in rapid expansion, Chi Phi added only three chapters. During Brother Gladfelter's service, seventeen new chapters were chartered. In 1972, the Chi Phi Educational Trust received a major bequest from the estate of Brother Herman O. Swanson, Alpha-Tau '14 (Michigan). Amounting to nearly $1,000,000, these funds greatly assisted the Trust in providing scholarship and leadership programs and greatly increased the number of loans and scholarships made to members. The fraternity celebrated its 150th anniversary with nationwide events for alumni and chapters throughout the year. The year of celebration culminated at the 1975 Sesquicentennial Congress held in Asheville, North Carolina. Early in 1975, upon Brother Gladfelter's retirement, Brother Ray Donohue, Omega '61 (Georgia Tech), was appointed National Director and served until 1978. Randolph M. Loos, Theta Delta '77 (Florida), was appointed in 1978. In the summer of 1980, Steven L Schneiderwind, Alpha Theta Chi '73 (Nebraska) was appointed National Director after having served as Grand Zeta from 1975 to 1979. The Congress of 1980 authorized the Thomas A. Gehring Chapter Excellence Awards as a tribute to the memory and constructive work of Dr. Thomas A. Gehring, Iota Delta '60 (Indiana), a former Grand Officer. Each year the top Chi Phi chapters are presented recognition awards at the Congress. The most improved chapters are also recognized. Campus unrest of the late 1960s and early 1970s took a great toll on fraternities, including Chi Phi. It was very unpopular to belong to such structured organizations. The 1980s saw a total reversal. Fraternities were stronger and more popular than ever. The 1980s again brought growth to Chi Phi. Six chapters, which were lost during the unrest, were reestablished. Chapters at Princeton and Hobart were established after a dormancy of over 100 years. In 1988, the Krannert Leadership School took a huge step forward as the leadership sessions were greatly expanded in duration and in depth. The leadership school was renamed the Chi Phi College of Excellence and has evolved into Chi Phi's premier annual event, offering outstanding leadership training for our undergraduate and alumni members. In honor of Brother Krannert, the opening presentation of the College of Excellence is now named the Krannert Keynote Address. To provide a lasting tribute to the memory of his father, Brother William Hutchinson, Xi '39 (Cornell), provided funds to The Chi Phi Educational Trust to endow a portion of the annual College of Excellence. Accordingly, the Trustees of The Chi Phi Educational Trust designated that the concluding major event of each College of Excellence, the Awards Program, include a keynote address to be known as the Alfred H. Hutchinson Keynote Address. In the late 1980s and early 1990s, Carl J. Gladfelter, Alpha-Tau '33 (Michigan), former Grand Alpha from 1953 to 1957 and National Director from 1960 to 1975, updated The Chronicles of Chi Phi, recording Chi Phi's history from 1939 to 1976. Editorial assistance was provided by Aldus M. Cody, Theta Delta '36 (Florida), who chaired the Chronicles Committee from 1990 to 1992. Former Chakett Editor Robert Cody, Theta Delta '40, was responsible for many of the photographs appearing in the volume. Unfortunately, he passed away in the summer of 1992 before he could see the results of his effort. The newly expanded Chronicles of Chi Phi was published in 1993 in both a registered hard-cover version as well as a soft-cover format. Copies can be obtained by contacting the fraternity's national office. A further update of The Chronicles from 1976 to the present is being compiled at this time. Steven L Schneiderwind, Alpha Theta Chi 1973 (Nebraska), completed the longest tenure of any National Director of Chi Phi in 1996. During his tenure, the fraternity roll expanded from 42 to 60 chapters and colonies. During this period, the level of annual voluntary dues support, received from alumni, more than doubled. Also of note was the service of Greta Anderson, who joined the national office staff in 1977 and continued until 1996. Brother Richard T. Lane, Kappa Zeta 1993 (Purdue University) was elected to a two-year term (2005-2007) as Grand Alpha in 2004 and Brother Rocco H. Carnevale, Mu 1980 (Stevens Institute of Technology), who was elected Grand-Alpha Elect in 2006, will commence his two-year term (2007-2009) on June 22, 2007. Brother Michael Azarian, Psi Delta 1997 (North Carolina, Charlotte), was appointed Executive Director in February of 2004. He has previously served the Fraternity as a Chapter Alpha, Chapter Advisor, COE Faculty Member, Chapter Leadership Consultant, Director of Expansion, and Director of Undergraduate Services.